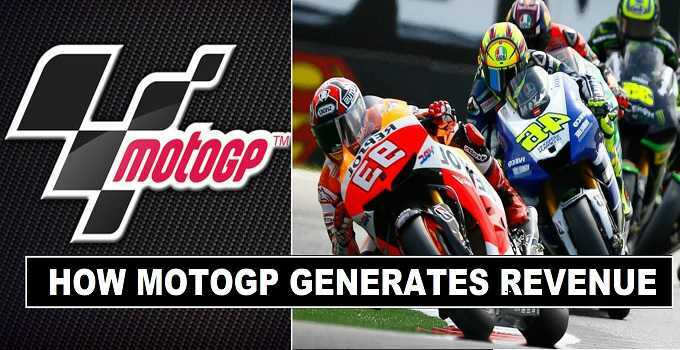 How revenue generated in MotoGP. A number of Motorsports racing fans like to understand the economic situation for a season of MotoGP. The system of money making run just like Formula one system, but if we compare the revenue profit its way lower then F1 races per race earnings and money distribution. Dorna is the actual company of MotoGP that generates revenue. Here you will see how the money made from MotoGP races. A grand prix race promoter pays a specific amount of money to MotoGP (Dorna) to host a race. Tv money mostly generated from television viewership. Once the sports become popular the coverage rights sold to channels world wide. Later to present on the local channels. There are some other ways that MotoGP management uses to earn revenue by selling rights (video games making comapnies , sponsorship deals and MotoGP official website memberships). As the sources confirmed, that some race are host on cost ($5.5 Million) but as previously a large number of fan base made for MotoGP. Now some circuits managements pay huge money to (Dorna) to host the race which is maximum cost upto ($10-$12 Million). So at the end of each season MotoGP estimated earn annual net income around ($120 million). In 2010, Motorland Aragon signed a contract deal with MotoGP of 6 year on which they will pay the (€41 million euros) during the contract time period which means, that Motorland Aragon each race cost (€7 million) a year. MotoGP sell its tv rights to world wide channels, for example BT Sports who got television rights of MotoGP to show the coverage in United Kingdom they pay ($100 million) a year. The oval rights sold to all channels is about ($150 million). Not only this MotoGP holding company (Drona) spend huge money on producing a global feed for the broadcaster. Another source from MotoGP made big money that is sponsorship deal with top motorsports companies such as (Tissot, Michelin, Singha, BMW, DHL, Red Bull, Monstor Energy) are long term partners of MotoGP. In 2013, sports magazine claimed that Drona makes netting from the Sponsorship deals estimated ($120 million). Yes some of the bike making companies earn. MSMA earned $10 million which include around $2 million for producing every satellite bike. So that means satellite bike making companies earn extra amount. No such information revealed so far about prize money procedure. But some other MotoGP class riders earn money by winning the race. The rider who finish 1st in Moto3 make (€3500). Winner of Moto2 race earns (€3000) and Z Cup winner received (€600). Here you get details about prize money for the MotoGP winning riders. its not disclosed by the authorities it is currently kept secret from Public. MotoGP riders with experience of 2-3 years racing. Signed professional racing contracts from MotoGP team. Riders who become the world champion gets extra wage and salary increment for upcoming season MotoGP season. Not only this they earn from the sponsorship deals they signed with Motorsports companies and other marketing companies.